Stopping your Camry is the job of the brakes, and without genuine OEM Camry brake pads, you may not get the stopping power you need. The brakes are a wear and tear item that needs to be maintained in order to get the best performance. Brake pads wear out over time because they’re subject to high heat and a lot of friction. When you replace the brake pads on your Camry, get OEM genuine Toyota brake pads. They’re optimized to deliver the right stopping power for the weight of your Camry, they’ll be made to fit the way the factory intended, and they’ll last as long as the factory pads. Olathe Toyota Parts Center carries these brake pads for your Camry. 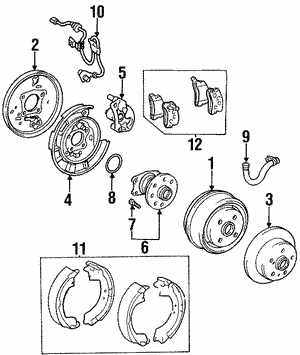 We also carry other brake parts such as rotors, calipers, and ABS parts. When you buy your genuine OEM Toyota parts from us, you get more than genuine parts and accessories. You get our superior customer service from highly trained staff. They’re ready to answer any questions you may have about your Camry. We have wholesale pricing so you get the best price possible, and we offer same day shipping in most cases. Buy your new Camry brake pads today!